Another exciting fun run is set to happen this coming September 2015. This time, it is a fun run which empowers the entrepreneurs. 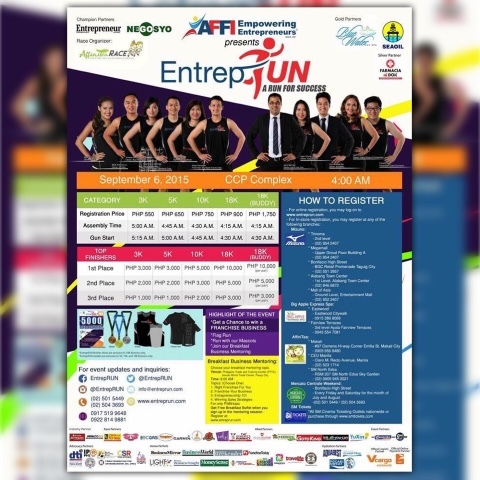 Brought by the biggest entrepreneurs in the country, are you ready to run for success in this another anticipated running event dubbed as the EntrepRUN?! From the company which gives us the successful major running events like Raise D' Roof and Brown Race in cooperation with Negosyo, Entrepreneur, and AFFI, EntrepRUN is set to conquer the CCP Complex on September 6. You may choose in the following categories - 3K, 5K, 10K, 18K, and 18K Buddy Run. For online registration, you may log on to www.entreprun.com while for on-site registration, you may visit the following stores with branches mentioned in the poster above - Mizuno, Big Apple Express SPA, Mercato Centrale Weekend, and Affinitea. What's more interesting about this run is that you may win a franchise business during the actual race.